"I am here to tell you that your Dorian Fusion Xpansion pack is literally the greatest thing that I have ever bought in the history of musical/ guitar education. It is a huge blessing to the guitar world. Thank you soo much, you are a huge blessing! " "Hi Rick! Just a few words to say that your lesson "Dorian Xpack" is maybe the most incredible lesson i've ever learned! The lines are so fresh and inspiring!" "Your lessons Dorian and Legato lines are changing my life. Great stuff by far one of the best buys on tuitional vids"
Do you already own some of the lessons in the bundle and would like to purchase the bundle minus what you already have? Please contact me via the contact page for a quote. RICK'S BEST SELLING HD VIDEO PACKAGES - NOW IN ONE COMPLETE PACKAGE! Was $275 now $195! SAVE $80! 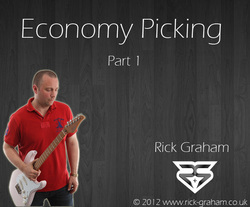 ECONOMY PICKING PART 2 -AVAILABLE NOW! 3 HOURS AND 50 MINUTES OF VIDEO! In the eagerly awaited follow up to 'Economy Picking Part 1', I take up where part 1 left off and delve further into my unique approach to economy picking technique. In the 72minute long HD video, I kick off proceedings by improvising over 3 backing tracks and then share with you how I have developed complete control over my right hand picking technique. This is then followed by a plethora of economy picking examples and patterns that I use during improvising. All of the examples are played up to speed and then explained in a clear and concise manner with all left and right hand fingerings/pickstrokes given. The package includes a 47 page PDF tab book containing transcriptions of everything in the video as well as Guitar Pro files and 3 HQ backing tracks for you to create your own improvisations with. 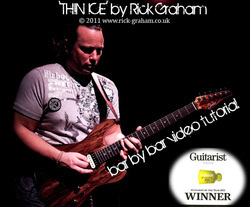 THE PACKAGE ALSO CONTAINS A FREE 2hour 36minute LIVE HD VIDEO MASTERCLASS WITH RICK! KILLER SHRED TECHNIQUE - AVAILABLE NOW! Join me as I show you how to develop Killer Shred Technique! In the 1hour 6minute long FULL HD VIDEO, I take you through 21 killer shred lines, which use a combination of Sweep Picking, Speed Picking and Legato techniques. The licks that are contained within the lesson have been taken from my 'Warming up at Licklibrary' Youtube video, which has been described as 'an awe-inspiring demo of insane technique and musicality' and has caused a stir within the guitar community. The original solo demo video is included in the package in FULL HD. All examples are demonstrated in a clear and concise manner and both the left and right hand fingerings and patterns are explained in depth. In the eagerly awaited follow up to part 1, I take you through another beastly concoction of essential pentatonic sequences, this time with the focus being on legato technique. In the 42 minute FULL HD VIDEO, i take you through another 25 of my favourite sequences that I use in my soloing on a regular basis. I'll take you through each sequence in a clear and concise fashion with a thorough explanation of the requirements of both the right and left hands. THIS LESSON NOW INCLUDES A FREE BONUS VIDEO! Join me as I take you on a journey through the mechanics of and application of Economy Picking. In the 1hr 20min long FULL HD Video, I will talk you through my approach to understanding and applying the technique with full and concise explanations of the essential elements of economy picking technique. I will then take you through a series of essential exercises, which include the most effective and most commonly used picking permutations. This is followed by a section of advanced lines, which all demonstrate the previous picking permutations, showing how they can be used in a musical context. All examples are played up to speed and then explained thoroughly, with every single pick stroke shown and explained. The package includes a full PDF of everything covered in the Video, with all transcription and picking patterns notated as well as 17 backing tracks and also Guitar Pro files for each example. As a special bonus, you will also receive a FREE 1hour 40min Live Masterclass Video, covering improvisation and related topics. The link for the masterclass video will be sent to you in a separate email. I'm very pleased to be bringing you the first in as series of backing track packages designed to be used in conjunction with my lesson releases. 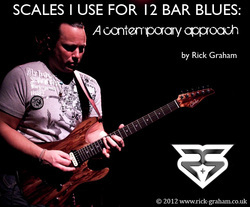 Although it can be used on its own, this backing track package is designed to be used in conjunction with my lesson: Scales I Use For 12 Bar Blues - A Contemporary Approach. It contains 5 high quality blues backing tracks, each one in 3 different keys making a total of 15 backing tracks altogether. The chords within the backing tracks are all dominant 7th shell voicings giving the soloist free reign to craft their melodic landscape. Click 'add to cart' if you wish to make a multiple purchase. In the 50 minute HD video lesson, I take you through my thought process and discuss the chord changes used in the backing tracks and the scales required to play over them . The solos include an awesome array of tasty licks, lines and techniques that you can digest and incorporate into your own playing and will serve as a great foundation to create your own musical ideas. For this latest lesson I take you through my specific approach to soloing over 12 bar blues progressions. The lesson itself is based around 3 killer solos over 3 different style blues backing tracks (in different keys and at different tempos). I take you through my thought process and discuss every single scale that I use within the example solos . The solos themselves include an awesome array of tasty licks, lines and techniques that you can digest and incorporate into your own playing and contain a wide variety of scales such as modal and altered pentatonics, melodic minor modes and diminished scales. 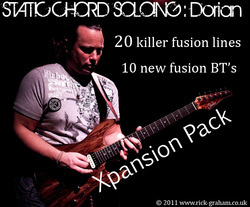 I'm very excited to announce the first of a series of Xpansion packs for my Static Chord Soloing series. 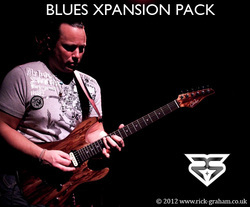 This exciting package contains 10 all new funky fusion backing tracks with 20 killer lines to go with them. Each lick is played and then broken down for you to digest easily and consists of scales and arpeggios covered in both Static Chord Soloing 1 & 2. 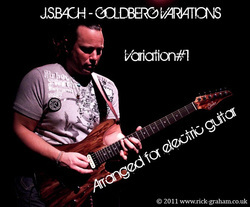 The lines all feature a heathly balance of contemporary guitar techniques such as legato, speed picking, intervallic lines, right hand tapping, slides and much more. Backing tracks come in a variety of keys including Bb and Eb. 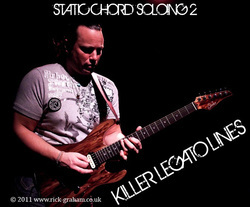 _This substantial lesson is in two parts: Part one covers my particular approach to Legato technique with various essential subtopics including muting technique, rhythm, controlling tension, my 3 essential legato methods and part two gives you the opportunity to learn 15 killer legato lines over a variety of different harmonic contexts. _ In this lesson I discuss some of the scale and arpeggio choices that I make when playing over a static groove. These include regular diatonic arpeggio scale choices to more far out melodic minor and diminished scale ideas. 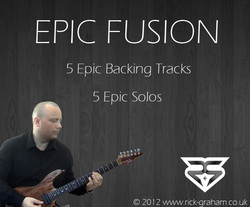 Although this lesson is suitable for any player of any style, the rock player looking to advance into more fusion based territory will really benefit from this. In this latest video lesson we take a bar by bar musical journey through my track 'Just A Dream' which is the third track on my debut album 'Insideout'. I also discuss the inspiration behind the track as well as a detailed description of the gear used for the album recording. This package contains a high quality promo studio video of the track as well as two different backing tracks and two different mixes of the album track. It features the amazing Sebastian Persini on drums. 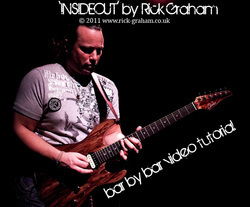 _In this video lesson I give a complete bar by bar breakdown of the title track from my 2010 album 'Insideout'. This track is full of my trademark licks and lines as well as modern soloing techniques. For a limited time it comes with an extra bonus video and tab. FOR A LIMITED PERIOD ONLY THIS PACK COMES WITH EXTRA BONUS VIDEO AND TAB! _ To celebrate winning Guitarist Magazine's Guitarist of the Year I have made a brand new downloadable HD video package available. It is a full performance of the winning track with lesson shot in full HD video. Full 11-page transcription of ‘Thin Ice’ by Jordan ‘Bakerman’ Baker who has been responsible for transcribing, among many others, the work of U.S. band Dream Theater. A full video performance of the track ‘Thin Ice’ along with breakdown videos of the entire track filmed in Full HD 1080p resolution. MP3 album recording of ‘Thin Ice’ taken from my debut album ‘Insideout’. _The first variation in this series is now live and available for you to download. In this lesson I take you through the upper and lower voices of my own arrangement of Variation number 1. It's simply full of beautiful lines which are a fine example of tension and resolution and can serve as a superb way of improving not only your technique but also your improvisation through targeting chord tones. 3 HD 1080p videos: upper and lower voice tutorials and full performance. 6 mp3 files: individual upper and lower voices recorded at 70, 90 and 110bpm enabling you to play along and also record your versions. For the first of a new series of FREE lesson packages I take you through my approach to using Octave Displacement techniques to improve your knowledge of intervals. This lesson requires a good knowledge of scales and their formulas although all examples given are contained within the PDF file within the package itself. 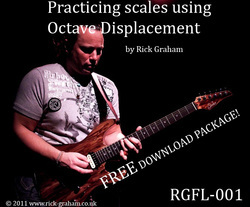 PDF file including tabs and scales/scale formulae used in the video. 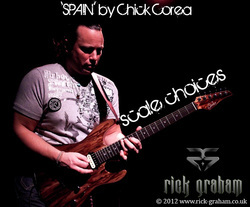 In this second FREE download I take you through some of my scale choices when soloing over the classic tune 'SPAIN' by Chick Corea. No HD video is included in this package as the full video has been uploaded to my Youtube Channel. You can watch it in full below.